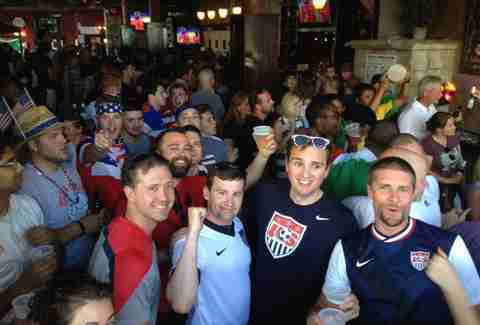 N o matter how divided our nation might get, we at least have this in common: Every four years, we’ll enthusiastically convene in bars and struggle to remember the rules of soccer. Yes, it's time once again for the World Cup (played this time in Russia, of all places), running from June 14 through July 15. While Cleveland might not be a huge soccer town -- remember the Crunch, anyone? -- and the US team didn't actually make the cut this year, and the games will be airing during the morning/daylight hours, we’ll still gather to watch the world’s most popular sport in action (after the Cavs take the Finals, of course). Whether you’re a casual viewer or a die-hard Crunch fan waiting on a revival, this guide will help you pick the best venues to consume a pint while yelling “Gooooooooal!” at the top of your lungs; we'll also be updating it with food/drink specials as they're announced. It will not help you understand how “offsides” works, though, so sorry about that. Considered Cleveland's go-to soccer bar, The Old Angle’s comfortably low lighting and mellow vibe nicely replicate the feel of a real UK pub. That chill goes right out the window when the World Cup comes around, though, and this place is sure to be a lively spot to catch the games. 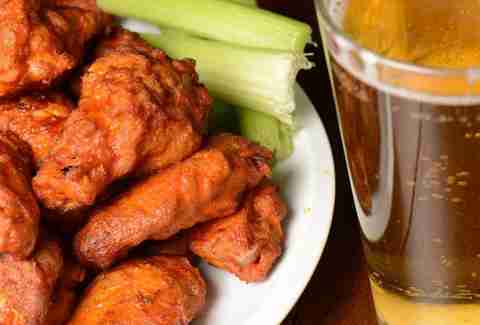 Be sure to enjoy an order of wings or a burger -- The Angle’s kitchen is among Cleveland’s hidden bar gems. Since picking up and moving from its original Cedar Lee location, Parnell’s looks a lot more like a real Dublin tavern, and it has more space for revelers and hooligans. 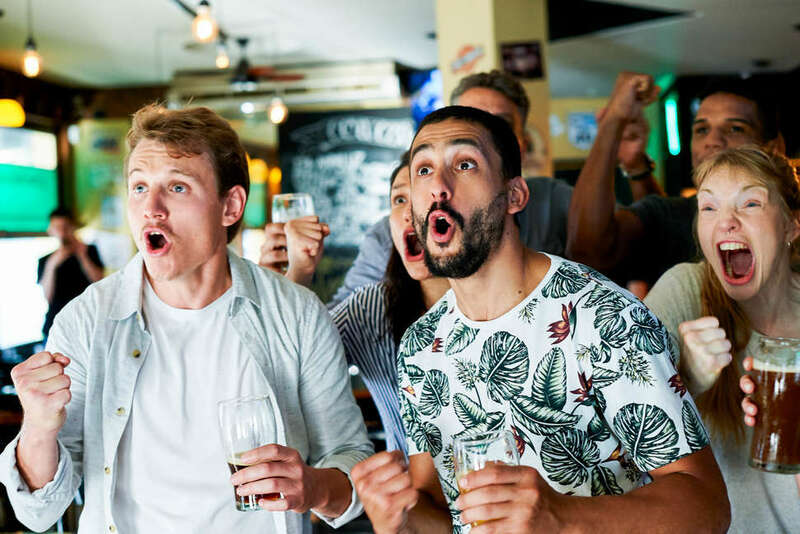 Though Ireland didn’t make the cut this year, you can still come here to enjoy a game and probably the best-poured pint of Guinness in the city -- in fact, you can probably root for any team here without fear of hooligan reprisals. With its charmingly dated decor and criminally underrated kitchen -- you will not believe how little has been written about that burger -- Hansa mostly lives in the shadow of its neighbor, Great Lakes Brewing Company. Pro tip: The smoked beer is an easy-drinking beverage for beer snobs and Bud drinkers alike. Germany is in the World Cup this year as well, so expect the bar to get going for those matches. An Irish-ish pub with a specialty in making (what else?) tacos and quesadillas, Merry Arts is a Lakewood watering hole perfect for catching a match any time of day. Allegedly the oldest bar in the neighborhood, Merry Arts also boasts one of the area’s best patios and some nicely cheap domestic pitchers. With a wonderful mix of Cleveland State staff and in-the-know students, karaoke devotees, and devoted Cleveland barflies, Becky’s is a spacious, gloriously unpretentious establishment bringing Clevelanders from all walks of life together. The wings are super-cheap, and the TV screens, though not large, are numerous. You’re guaranteed to find at least a few hooligans at all times of the day. The Kamm’s Corners district in West Park is a very walkable enclave of hard-partying sports bars and Irish pubs. PJ McIntyre’s has the most over-the-top Irish decor of all them, and the rowdiness for World Cup games should rise to that occasion. The bar claims to be “the most authentic” Irish pub in Cleveland -- a bold claim indeed! -- but they do have a $2.50 Power Hour for Guiness and other Irish beers on Fridays, so we’ll give it to them. At this ubiquitous Cleveland-area chain known for their beer selection -- up to a hundred varieties or more, depending on the location -- you can enjoy a beer from just about every country competing in the World Cup, and then some. There's no better time than the Cup to begin the Lizard’s famed Tour of Beers, which awards customers for trying 100 beers in one year. A student-run bar not afraid to experiment with brewing, The Jolly Scholar is a campus-area bar that’s friendly to outsiders. With a relaxed vibe and way-better-than-average bar food, this is a near-ideal spot to catch a late morning or afternoon match. Bask in the humble vibe, start some chants with the college crowd, and enjoy the 24 beers on tap. The World Cup has always been huge at Flannery’s. Perhaps Cleveland’s busiest Irish-themed bar, Flannery’s sits right at the mouth of the foot traffic-heavy East Fourth Corridor. It’s an excellent stop-off before and after Cavs games, so World Cup watchers can catch matches between (fingers crossed) Finals games. In addition to the Cup games, you'll also get to enjoy occasional live music (Irish, of course), as well as one of the best Irish whiskey selections in the city. 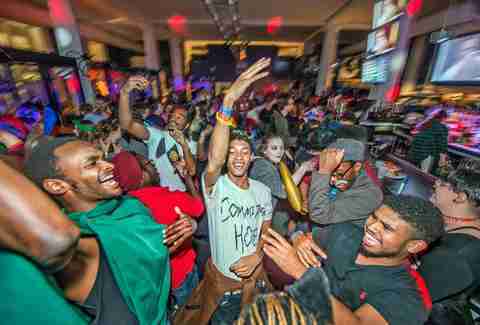 Find out where to watch the World Cup games with all the soccer fans in your city with our list of the best World Cup bars in NYC, LA, SF, Chicago, DC, Miami, Houston and more. Sign up here for our daily Cleveland email and be the first to get all the food/drink/fun in town. Billy Hallal is a writer for Thrillist. Follow his Cleveland adventures at @HillyBallal.